New York, March 11--Arthur Hopkins, distinguished veteran Broadway producer, presents a series of plays on the National Broadcasting company network starting April 12, recreating in radio versions many of his great its of the last three decades. The series will be titled "Arthur Hopkins Presents" and will be heard every Wednesday at 11:30 p.m. (EWT). The plays will run a full hour and will feature as nearly as possible the original stars who created the roles. Wyllis Cooper, widely known radio writer and head of the program development division of NBC, will write the scripts. Among the early productions contemplated are "Our Town" with Frank Craven; "The Philadelphia Story" with Katharine Hepburn; "Anna Christie" and "The Deluge" with Pauline Lord; "Burlesque" with Barbara Stanwyck, and plays with Raymond Massey, Eva Le Gallienne and Joseph Schildkraut, Philip Merivale, June Walker, Edward G. Robinson, Ralph Bellamy and many others. His productions since he turned from journalism to produce "The Poor Little Rich Girl" have covered a wide range of authors and stars. He has staged Shakespeare, Tolstoy, Ibsen, Hauptman, Sophie Treadwell, Eugene O'Neill, Elmer Rice, Robert Sherwood, Sidney Howard, Philip Barry and Zoe Akins. A few of hte great artists who have played under the Hopkins banner are Mrs Fiske, Ethel Barrymroe, Nazimova, Pauline Lord, Laurette Taylor, Katharine Hepburn, William Gillette, John Drew, John and Lionel Barrymore, Leslie Howard, Clark Gable and Edward G. Robinson. This series of programs marks Hopkins's radio debut. Commenting on his new role Hopkins stated: "For years we have talked of a people's theater and a repertory theater, always thinking of them in the limitations of brick and mortar, train schedules, baggage cars and limited capacity audiences. In the meantime, the microphone has found an immediate audience of millions. Plays that can live only when spoken have lain too long in undisturbed libraries. The medium is here. The plays are here. And fortunately the National Broadcasting company is about to bring them together. Wyllis Cooper wrote the popular radio series "Lights Out" and "Good Neighbors" and was author-producer of the "Army hour." He has been radio actor and producer and motion picture writer. He was head of the script department of NBC's Central division before coming to New York as writer and producer. "COMMUNITY theatres for stage plays are coming eventually and radio theatres can develop audiences never dreamed of for these peoples' theatres," Arthur Hopkins, veteran Broadway producer, stated during an interview at National Broadcasting headquarters here this week in discussing his forthcoming NBC program "Arthur Hopkins Presents." The full-hour dramatic program designed to present top plays of the past as a more or less permanent weekly feature will have its premiere on April 19 with the presentation of "Our Town." Broadcast time of 11:30 p.m. will take advantage of the increasing late evening audiences which have been developed with the lengthened broadcast day, Clarence L. Menser, NBC vice-president in charge of programs explained during the interview. Theatre stars who are film stars as well will participate, including Barbara Stanwyck, Katharine Hepburn, Edward G. Robinson, Raymond Massey, Frank Craven, Philip Merivale and Louis Calhern. "Eventually, an attempt might be made to develop new talent on a nation-wide basis," Menser declared in outlining NBC's purpose in presenting the program. Unproduced plays might also be used eventually. Thorton Wilder should write more plays and Wyllis Cooper should adapt them for radio. Last Wednesday night NBC-WRC offered a new program, "Arthur Hopkins Presents," an hour-long play beginning at 11:30 p.m. "Our Town," it was, the simple story in fantasy of a New England village, its life, its romance, and its deaths. You will probably recall it as the Pulitzer Prize play of 1938; perhaps you will better remember it as the first of the series of stage presentations produced without scenery. The explanation of hte action and setting of "Our Town" was done by Frank Craven, who, as the stage manager, played the role both on the air and in the original production. He did an excellent job. Mary Patton, as Emily, did a polished job, too. The entire production was well cast and skillfully performed. Occasionally the projection of an artist accustomed to the theater overrode hte delicacy of a microphone, but the voices were excellent. Three scenes were so deftly handled and beautifully performed that they will long remain as high spots in radio drama. The first of these was the scene in Morgan's drug store in which George Gibbs and Emily discover that they are in love. The second was the wedding scene, handled with just the proper mixture of respect, humor and sidelight. The third was the graveyard scene, in which the purpose of Thornton Wilder was brought home, the touching and powerful theme of the goodness of life which is fleeting. It seems that some details were overlooked in the drive for perfection of timing and voices and lines. The orchestra was not well balanced, hence was thin and not blended. The sound effects were at times inept and some could have been eliminated without loss. There was a feeling of push for time, of trying to get more than an hour in 60 minutes, but that was true only in the first half of the production. But those are details which can be ironed out in the future. 10:30 p.m.--Arthur Hopkins Presents (WIBA): Robert Sherwood's "The Petrified Forest." 11:30--WEAF--Arthur Hopkins Presents: Play, Holilday with Hope Williams, Tom Rutherford. A planned dramatic series, "Arthur Hopkins presents," originally set to open on NBC Wednesday night, has been postponed one week. Arthur Hopkins Goes on the Air "Our Town," Pulitzer Prize winning play by Thornton Wilder, will open the new N.B.C. dramatic series, "Arthur Hopkins Presents" next Wednesday at 11:30 p.m. Mr. Hopkins, Broadway producer, will be at the producing helm. Frank Craven, now appearing on Broadway in "Mrs. January and Mr. Ex," a Zoe Akins comedy, will head the cast as the stage manager, the role in which he made theater and motion picture history. Evelyn Varden, Helen Carew, Thomas Ross and Phil Coolidge also return to play their original characters in the play. In addition, Mary Patton will play Emily and Howard Smith, Dr. Gibbs. 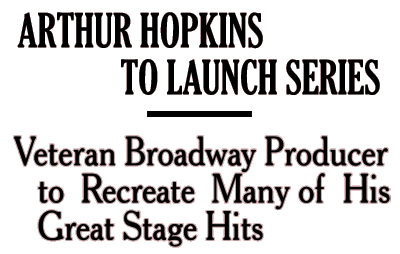 New Program 10:30 p.m.--Arthur Hopkins Presents (WIBA): series of best known Broadway successes produced by Arthur Hopkins: premiere, "Our Town" by Thornton Wilder, with Frank Craven, star of original play. 10:30 p.m.--Arthur Hopkins Presents (WIBA): Dorothy Gish and Louis Calhern in Leo Tolstoy's "Redemption;" performance dedicated to the late John Barrymore, who scored one of his greatest triumphs in the play. 10:30 p.m.--Arthur Hopkins Presents (WIBA): Philip Merivale in Clare Dummer's "A Successful Calamity." 10:30 p.m.--Arthur Hopkins Presents (WIBA): Katharine Hepburn in "Philadelphia Story." 10:30 p.m.--Arthur Hopkins Presents (WIBA): Pauline Lord and J. Edward Bromberg in Eugene O'Neill's "Anna Christie." 10:30 p.m.--Arthur Hopkins Presents (WIBA): Dudley Digges in Eugene O'Neill's "Ah, Wilderness." 10:30 p.m.--Arthur Hopkins Presents (WIBA): June Walker and Wendell Corey in "The Famer Takes a Wife." 10:30 p.m.--Arthur Hopkins Presents (WIBA): Sidney Blackmer, Zita Johann in Sophie Treadwell's melodrama, "Machinal." 10:30 p.m.--Arthur Hopkins Presents (WIBA): Grace George in Somerset Maugham's "The Circle." 10:30 p.m.--Arthur Hopkins Presents (WIBA): Pauline Lord and Sidney Blackmer in "The Late Christopher Bean." Arthur Hopkins announces there will be no airing next week due to the Republican Convention. 44-06-28 New York Times - Republican National Convention--WEAF, WOR, WJZ, WABC, 10-11. 10:30 p.m.--Arthur Hopkins Presents (WIBA): Zazu Pitts in "Mrs. Bumpstead-Leigh." ARTHUR HOPKINS PRESENTS (WTAM) was confronted with a major replacement Wednesday night when Zasu Pitts bowed out of hte comedy, "Mrs. Bumpstead-Leigh," but I doubt if the motion picture actress could have equalled the performance given in the title role by her replacement, Estelle Winwood, now in Broadway's "Ten Little Indians." The actress did excellently with the part, playing it straight. Her voice was arresting, although some dialers may have thought it a bit too mature. Even so, those who listened, must have found the play enjoyable. 10:30 p.m.--Arthur Hopkins Presents (WIBA): "The Last of Mrs. Cheney" with Mary Philips and Roland Young, or original stage cast. Martin Magner, Euroean and American director, has succeeded Wynn Wright as director on "Arthur Hopkins Presents." Wright continues his association with Arthur Hopkins and the program in a supervisory capacity because of pressure of duties as NBC's national jproduction manager. 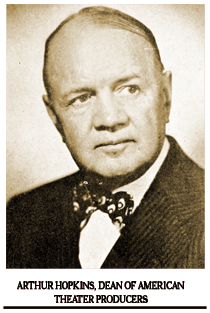 Magner was invited by Wright to come to New York from Chicago where he was working in the NBC central division. He thus renews an old association with Wright who first engaged him. The new director was an actor, director and producer in the leading theaters of Europe from 1919 to 1939. 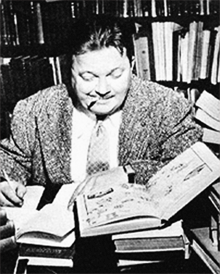 He has directed plays ranging form Greek drama to modern experimental plays, and his associates included among others, Albert Basserman, Emil Jannings and Luise Rainer. 10:30 p.m.--Arthur Hopkins Presents (WIBA): Helen Hayes in "The Lady with a Lamp." 10:30 p.m.--Arthur Hopkins Presents (WIBA): Geraldine Fitzgerald in Somerset Maugham's "The Letter." 10:30 p.m.--Arthur Hopkins Presents (WIBA): "Yellow Jack" by Sidney Howard. 10:30 p.m.--Arthur Hopkins Presents (WIBA): Ferenc Molinar's "The Swan," with Eva Le Gallienne playing Alexandra. 10:30 p.m.--Arthur Hopkins Presents (WIBA): "The Deluge," with Pauline Lord. 10:30 p.m.--Arthur Hopkins Presents (WIBA): John Galsworthy's "Justice," with Estelle Winwood, Bramwell Fletcher and Horace Braham. 10:30 p.m.--Arthur Hopkins Presents (WIBA): "Excursion" with Whitford Kane in his original Broadway role. 44-09-13 Hanover Evening Sun - Arthur Hopkins Presents: "Bill of Divorcement," with Zita Johann, Edgar Stehli and Dorothy Knox--WEAF 11:30. 10:30 p.m.--Arthur Hopkins Presents (WIBA): "The Buccaneer" by Maxwell Anderson and Lawrence Stalling; cast, Estelle Winwood, Edgar Stehli and Horace Braham. 10:30 p.m.--Arthur Hopkins Presents (WIBA): Clare Kummer's comedy, "Her Master's Voice," with Roland Young, Frances Fuller and Hilda Spong. 10:30 p.m.--Arthur Hopkins Presents (WIBA): "Escape" by John Galsworthy, starring Dennis King. 10:30 p.m.--Arthur Hopkins Presents (WIBA): Elliott Nugent in "The Male Animal." 10:30 p.m.--Arthur Hopkins Presents (WIBA): Violet Heming and Cecil Humphreys in A.A. Milne's "Mr. Pim Passes By." 10:30 p.m.--Arthur Hopkins Presents (WIBA): Aline MacMahon in Eugene O'Neill's "Beyond the Horizon." 10:30 p.m.--Arthur Hopkins Presents (WIBA): Hope Williams and Tom Rutherford in "Holiday" by Phlip Barry. 10:30 p.m.--Arthur Hopkins Presents (WIBA): "Home Came the Steed" by Edith Russell, starring Sidney Blackmer.
. . . ARTHUR HOPKINS PRESENTS made a fine showing in the dramatic division. Coming at such a late hour, this excellent series has a problem catching a dialing audience. Even so, it gathered enough votes to nose out Suspense, a noteworthy series of thrillers, for second choice and even managed land a few votes as a first choice of all programs. Given the proper time spot, Arthur Hopkins Presents reveals it would hold a considerable audience. . .
Arthur Hopkins Presents (WIBA): "Berkeley Square," with Dennis King. Arthur Hopkins Presents (WIBA): Ralph Bellamy in "Roadside" by Lynn Riggs. Arthur Hopkins Presents (WIBA): "Street Scene" by Elmer Rice, starring Erin O'Brien-Moore. Arthur Hopkins Presents (WIBA): "Richard II," starring Dennis King. Arthur Hopkins Presents (WIBA): "The Bluebird," with Joyce Van Patten and Alastair Kyle. Arthur Hopkins Presents (WIBA): "The Joyous Season," starring Lillian Gish. Arthur Hopkins, one of New York's leading stage producers and directors, died yesterday of a heart attack in St. Vincent's Hospital, Manhattan. He was 71 and resided at the Hotel Russell, Park Ave. and 37th St.
Mr. Hopkins, a native of Cleveland and a former newspaper reporter in St. Paul, Minn., and Cleveland, booked acts in Summer amusement parks before embarking upon his career as producer. His first Broadway production was " Poor Little Rich Girl" in 1913. Other plays he directed included "Redemption," "The Jest," "Richard III," "The Wild Duck," "A Doll's House," "Anna Christie," "The Hairy Ape," "What Price Glory?" and his last play, "The Magnificent Yankee," based on the life of Justice Oliver Wendell Holmes. When taken ill he was planning to bring a new play by Thornton Wilder to Broadway this Fall. His wife, Mrs. Eva O'Brien Hopkins, died in 1938. He is survived by three brothers, Ben, Martin and W.R. Hopkins, all of Cleveland. Funeral services will be held at 11 a.m. Saturday at the Madison Avenue Presbyterian Church, Madison Ave. and 73d Street. 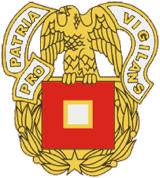 1st Batallion, 131st Infantry Coat of Arms. Willis Cooper was born in 1899 in Pekin, Illinios, to Charles Edgar and Margaret (Oswald) Cooper. He was joined a year later by his younger brother Harry Edgar Cooper. Upon graduating from Pekin High School, he entered the the U.S. Cavalry, serving initially as a Sergeant patrolling the U.S. border with Mexico. By 1917 he was in the Army Signal Corps as a member of the Allied Expeditionary Forces until 1919, at which time he returned to Illinois. His three years in the Army were far from uneventful. He'd chased Mexican Bandits on the border, he'd shipped overseas with the 131st Infantry, suffered a head injury from a German shelling in Germany, and he'd been gassed in the Argonne Forest. He continued to serve with the Illinois National Guard, as a Captain of the 31st Infantry. Cooper retained his commission from 1923 through 1933, serving the last five years of his commissioned service with the U.S. Cavalry Reserve. When not serving on active duty between 1919 and 1929, Cooper found several writing positions with Advertising concerns. Throughout that period he'd been employed variously as a photographer and ad copywriter in various places between Santa Monica, California, to Chicago, Illinois. He'd reportedly started his own advertising company while in Santa Monica. He'd married his first wife Beatrice shortly upon returning to civilian life. And by 1929 he'd apparently divorced his first wife and married the former Emily Beveridge in Chicago. 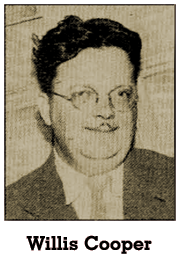 Willis Cooper began writing for CBS some time around 1931, as a continuity editor until 1933, at which time he took a position with NBC as a continuity editor. He apparently worked as a free-lancer, since he was writing for NBC's Empire Builders (1929-1931) while reportedly working for CBS at the same time. In any case, Cooper left NBC in 1935 to devote his full interest to Lights Out!. Apparently he was simply hedging his bets, since 1935 found him writing for Betty and Bob for WGN, Chicago before leaving Illinois for Hollywood, California to work as a screenwriter for the 20th Century Fox, Universal and Paramount studios. He tried to keep his hand in Lights Out! from L.A., but by 1936 he was notified that Arch Oboler had been contracted to take over Cooper's writing duties with Lights Out!. Between 1936 and 1939, Cooper received screen credits for Think Fast Mr. Moto (1937), Thank You Mr. Moto (1937), Mr. Moto Takes A Chance (1938), Son of Frankenstein (1939) and the serial, The Phantom Creeps (1940) with Bela Lugosi. Some time around 1940, in response to a request from his wife--an ardent numerologist--Willis changed his name to Wyllis with a 'y'. 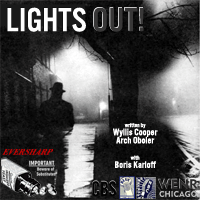 A prolific writer for Radio, Cooper wrote almost all of the 1934-36 scripts for Lights Out!, at least eight more Lights Out! scripts post-1945, all of the scripts for Quiet Please!, and of course the 500+ other scripts he penned before lending his hand to screenwriting in Hollywood. Television was a natural extension for both his writing and producing talents. Wyllis Cooper contributed to many of Television's earliest dramas, including his own short-lived Volume One (1949) and Stage 13 (1950), Escape (1951), Lights Out! (1951), Tales of Tomorrow (1951) and CBS's prestigious drama anthology, Studio One (1951). A Cooper story always ends with a surprise, a twist of some sort, many of them unexplained. The supernatural figures strongly, though in strange ways. Supernatural characters in Cooper's dramas are not terribly sinister. Many of them are more likeable than the humans in the script and some of them are just ridiculous and a little poignant. They are likely to pop in unexpectedly. You'll see (or hear of) a couple of guys at a bar drinking beer and suddenly become aware that one of them has four arms and hails from the moon. A Cooper story starts so slowly you can hear your heart beat, sometimes with a satiric twist right at the beginning. There was one about a private eye to whom nothing had ever happened. He'd had no adventures at all. And his secretary was no glamor girl, but a battleaxe, roughly 112 years old. Then a man walked in to discuss a murder. "Who was murdered?" asked the private eye. "I was," said the man, rather aggrieved about it. Some of these twists are little too elfin to stand analysis, but then Cooper is not long on plot anyhow. His gift is for mood and character. The listener gets so wrapped up in a Cooper character, wondering who he is, what he's doing there, and how its all going to come out, he'll sit on the edge of his chair for half an hour. And at the end of half an hour, he may still be pretty fuzzy about what happened depending on how explanatory pending on how explanatory Cooper feels at the moment. Like Henry Morgan, Cooper has no respect for or interest in listeners who are doing the dishes or who drop out to the icebox for a beer during his stories. He never repeats himself. "Why should I make concessions to the audience that doesn't pay attention?" he says. As a matter of fact, he doesn't make very many concessions to the people who do pay attention. At the end of half an hour they may be just as baffled as the dishwashers. There are few characters in any Cooper script, two or three or sometimes just one, and he uses more straight narrative than almost anyone. Besides insisting--against all the rules--on long stretches of silence. Cooper frequently has two people talking at once--again against all radio rules. In ordinary conversation, says cooper, everyone talks at once and they appear to understand one another, so why not in radio? In his single invasion of television Cooper's crotchets were as individual and startling as they were in radio. But that will have to wait until tomorrow. Wyllis Cooper, a writer of eerie, sometimes incomprehensible though remarkably literate radio and television dramas looks as if he'd stepped out of one of his own scripts. He's a short, bespectacled man, broad of brow and sweeping of girth. His double chin is an expanse of incomparable grandeur. He works, hunched over a typewriter like an intelligent spider, in a large office in the Hotel Brittany behind drawn blinds. The drawn blinds, he explains, are to protect him from street noises, which is the sort of contradiction he loves to use in his radio plays. After his single brush with television, a six-program series on ABC-TV entitled characteristically Volume 1 (Nos. 1 to 6), he is brimming with theories about television, most of them heretical. Television, he says, is neither a movie nor an illustrated radio show. Too much television, he feelsl, is just a bad adaptation of Hollywood techniques with cameras running wild all over the place. WINDOW IN ROOM Television, says Cooper, is really a window in your living room and should be treated that way. In his own series, Cooper tried to get the home audience to forget all about the cameras, to become eavesdroppers. The audience was told in the first of the plays, that it was seated behind a mirror. The audience could see every move of the characters; the characters, of course, could see only their own reflections in the mirror. Into the room--a hotel room--crept a man and a woman who had just robbed a bank and were using the place as a hideout. The camera never budged throughout the half hour. The woman would tidy her hair in front of the mirror--which was your television screen--then walk away. The man would stamp out a cigarette on an invisible bureau over which the mirror hung. An ordinary kitchen chair was the only prop. There was no scenery. The room was black as a cave except for spots illuminating the actors. Gradually, the couople became aware there was something very fishy about the hotel room. The bellhop, the only other character, seemed to know all aobut their crime and to pity them for it. Their money disappeared. They couldn't get food or, a more desperate need, cigarettes. And they couldn't get out of the room. Finally--if my interpretation of the convolutions of Cooper's brain is correct, and I wouldn't swear to it--they realized they were doomed to spend eternity in that hotel room with a neon light flashing off and on, off and on, outside the window and a jukebox playing the same dreary tune down stairs. It's a torment I wouldn't wish on my worst enemy. TYPICAL OF STORIES That is typical of the stories Cooper tells and also of this methods. He used no scenery in four of his six plays and only rudimentary scenery in the other two. The purpose was not to save money. The televisionscreen is so small, he says, that the viewer can't absorb the scenery and also see what the people are doing. He uses small casts because he thinks too many characters clutter up the action. As in radio, he was spate with dialogue. Cooper feels there is too much chatter in television. Yet the first script totaled 74 pages, two-thirds the length of a two-and-a-half housr play. Most of it was stage directions. Cooper is trying to establish on television the intimacy that was radio's peculiar distinction among dramatic forms. He admits it's difficult, but he says that the imitation of movie technique is the wrong way to go about it. "The movies can go into great detail," he points out. "In television, we can't. We haven't the time, the clarity, the size, or the Audience stimulation." (Audience stimulation: people in an audience stimulate one another. Two people in a living room don't vary much.) On the other hand, television has an urgency and a freshness that can't be duplicated by the movies. Cooper used to writer his little vignettes and throw them in front of the camera--three one-hour reading periods, six hours for rehearsals--before he had time to grow cold on the. HE STILL INSISTS his series was not experimental and was wildly indignant when ABC press releases listed them as such. "I had some theories about television and I proved them--to my satisfaction at least. The main rule, says Cooper: "Don't try to do what you can't do. You can't do 'Gone with the Wind' on television. Why does anyone want to do it anyway?" His brief experience with television left him unbowed--he'll undoubtedly be back--but he admits it wilted him a little. " I never heard 'You can't do that' so many times in my life," he says.